As the owner, the leadership in your small business is YOU, the most important person in the business. Unfortunately, the owner is sometimes the constraint to further growth because they tend to control or manage everything. Understandable. That’s how they’ve been successful in starting their business and getting it this far. We’re covering 7 steps to total leadership in your small business in this post. It’s everything you need to know and do to be the total leader… no matter your company size or industry. 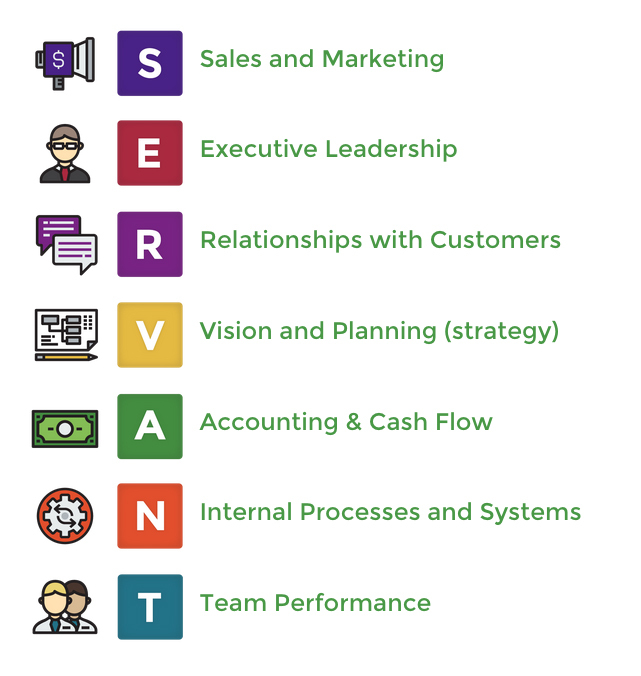 It’s part of our leadership consulting and SERVANT Whole-Business Model blog series – the “E” of SERVANT is for Executive Leadership. Once you’ve begun to delegate and others are beginning to drive the day-to-day part of the business, you need to bring them into your thinking. You want to develop a meeting rhythm which allows you to consistently interact with those you’ve delegated to. Since you no longer have your hand in every little thing that’s going on, you want to develop more sophisticated communications systems. Next is to build organization capacity. This may involve helping your delegees delegate to their team members. Or it may mean bringing in outside support for certain tasks to free key team members for the work that’s more related to the organization’s core purpose. Then begin to work with your team to remove roadblocks and constraints so that the business can grow freely. As the leadership in your small business, it’s important that you really are helping to develop the people in your organization. As a leader your primary function is to drive change so you’ve got to really get good at mastering the process of change management. As you do that you find yourself needing to coach your team mates more as opposed to doing the work yourself. You want them to get stronger, more capable, and to understand how to do the things you ask them to do. Certain people emerge from that process who seem to have the ability to lead. The next step is to create your senior leadership team and develop them because they will be the people through whom you drive future initiatives. Before, everything went through the business owner so their capacity was the organization’s capacity. When the leadership team drives things, the owner PLUS the leadership team’s capacity represents the organization’s capacity. It’s a beautiful thing. Once the leadership team is formed, they need to learn how to lead. Here’s where we implement servant leadership training for the team. Once they’ve developed leadership skills, you’re fully capable of operating the business through your leadership team. That frees you up to expand, to acquire new businesses, and to purchase other locations. If you’re thinking of selling the business, a major consideration on the purchase price is whether or not it can operate without the owner. And you now have more time for family, hobbies, and vacation. When you’ve mastered total leadership in your small business, you have a more balanced life AND you’ve enabled your business to grow. Learn how our leadership training in Indianapolis can help you to develop your leadership skills to ensure total leadership in your business.